Opening hours: General opening hours are Mon-Thurs 9am-12am & 2.30pm-6pm, Fri-Sat 9am-12pm. Some businesses (especially during high season) stay open until 10pm. The small, gritty port town of Banjul rarely figures as the final destination on visitor itineraries. If a few hours is all you have, explore the Royal Albert Market – the town's busiest commercial grounds – and shop around Ecowas and Liberation Avenues. If time permits, pay a visit to Banjul's most known landmark (Arch 22) – sweeping views unfold from its top floor. 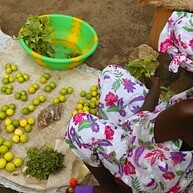 For further pursuits, look to nearby settlements, abundant natural parks and the beaches of Gambia's coastline. 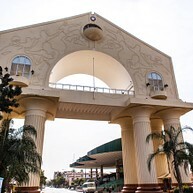 Built to commemorate the coup of 1994, the unmissable cream-colored structure is a great vantage point from which to take in Banjul in its entirety. There is a small museum on its second floor, containing traditional Gambian crafts, artwork, clothing, and even historic weaponry. The busy market is one of Banjul's primary attractions, a vibrant kaleidoscope of multi-colored peppers, all manner of foodstuffs (from rather standard fruit and vegetables to salted fish and even dried sea snails), fabrics, jewellery, and beauty products such as wonder-working shea butter. The local institution has supported disadvantaged women for decades now, offering training in fabric processing, craft-making, sewing, and other practical skills. 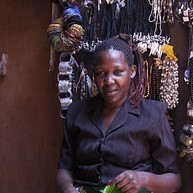 Hand-made products created by learners and graduates may be purchased at the adjacent shop at very reasonable prices. The National Museum of Gambia contains a vast collection of artifacts dating back to various points in the nation's past - from prehistoric and pre-colonial times to the most recent era. Items on display range from folk culture pieces to historic documents and maps of the region. The Bijilo Forest Park is most known for its inhabitants - it is home to a large population of monkeys, many of which do not mind interacting with visitors. Beware of unsolicited offers of being guided through the park, as the premises are safe and rather easy to navigate. Remember to bring peanuts, the monkeys' preferred treats (these may also be purchased on-site). The River Gambia National Park (or Baboon Island) is a collection of 5 river islands inhabited by all manner of indigenous animal species, from the endangered hippopotamus to omnipresent primates - bonobos and chimpanzees. The best way to experience this natural reserve is to stay overnight - the Chimpanzee Rehabilitation Project Camp (Badi Mayo) offers all-inclusive stays in safari tents on the water. 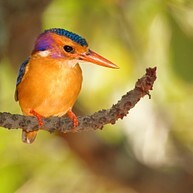 Gambia is home to multiple bird species, many of which are present in the wetlands down Kankujereh Road. To make the most of your bird-sighting, join a guided tour or start by taking a trip to Bijilo Forest Park & Nature Trail, known for its abundant fauna. A place of supernatural significance to locals, the Crocodile Pool is visited by women who have lost all hope to conceive a child - it is believed that a visit here may help the process along (hence the name "Kachikally" given to some children at birth). 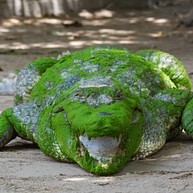 The pool is home to well looked-after Nile crocodiles, some of which are so tame they may be pet. Do not miss the adjacent museum, nature trail, and gift shop. Compact in size compared to some other nature reserves in The Gambia, Abuko is a convenient half-hour drive away from town. 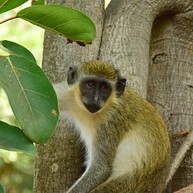 The nature reserve offers ample opportunities for bird-watching and interacting with resident monkeys. Skip the on-site zoo if seeing caged animals upsets you. 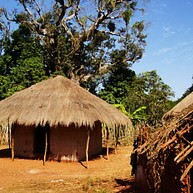 A visit to the Makasutu Culture Forest (about a 45-minute drive out of Banjul) is an experience to be had by visitors to the area looking to experience Gambian wildlife guided by an experienced local. There is a free to use on-site pool, so do bring your swimwear.